Union Pacific's articulated M-10000, built by Pullman-Standard, was the first true streamliner built in the U.S., beating Burlington and Budd's Zephyr 9900 to the punch by six weeks when it was delivered on February 25, 1934. The four car articulated trainset (as designed and built with an 8-section, compartment, and bedroom sleeping car) was powered by a 600 horsepower Winton distillate fuel engine and was capable of speeds up to 110 mph. UP crews nicknamed it "Little Zip". But the paint was hardly dry before changes started being made. First to go was the sleeping car, truncating the M-10000 to its final service length of three cars and 204 feet. (A regular visitor, Mr. John Perkowski, has informed me as to the car's history. Sleeper Overland Trail was outshopped by Pullman-Standard on May 24, 1934, four weeks after the rest of the train. After Little Zip's display at the Chicago Century of Progress exhibition, the car was removed from the M-10000 and reassigned to the M-10001, the new City of Portland. It served in that capacity until the M-10001 was scrapped in 1941.) Then the M-10000 was sent on a nationwide publicity tour, stopping in 68 cities and drawing over 1 million curious visitors eager to see this train of the future - the most famous being President Roosevelt himself. 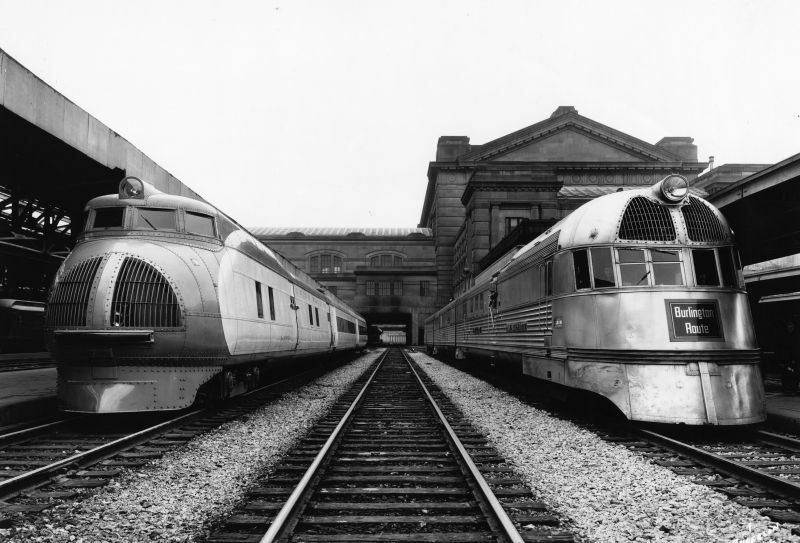 Union Pacific management must have been giddy with delight over the reception accorded their latest endeavor, to judge from the ambitious new streamliner construction program they embarked on and the various plans which rumor has them as having considered for their streamliner pioneer. The most outlandish I have heard was the proposal to place "Little Zip" in service between Chicago and Los Angeles on an incredibly accelerated 24 hour schedule, or nearly 96 mph average. Saner heads prevailed, fortunately considering that in that day and age most highway-railroad crossings were still unsignaled. But when the dust had settled and the train's day in the publicity spotlight had passed, Union Pacific still faced the question of what to do with the M-10000. The public's immense interest in the train had shown that it would be insufficient for the crush of business if operated between major terminals, while its unique, one-off design meant that there was no similar equipment to share the load of a longer distance run. Eventually UP decided to place the M-10000 in service between Kansas City and Salina, Kansas making one round trip a day (with an additional quick trip from Kansas City to Topeka and back in midday). Originally christened simply as The Streamliner when it entered revenue service January 31, 1935, with the introduction of its new streamlined stablemates it would be renamed the City of Salina. The M-10000 had been a spectacular success as a publicity tool, but as a practical train the limitations of its small scale, its fixed articulated design, and its lack of a running mate became apparent. While it was popular with passengers and less expensive to operate than a conventional steam-powered passenger train, it would serve as the City of Salina for only not quite seven years. In December 1941 "Little Zip" would be withdrawn from service and, shortly thereafter, would be scrapped for its aluminum content as part of UP's contribution to the war effort. The Union Pacific name and herald are trademarks of Union Pacific Railroad Company and are used with permission. Union Pacific "Overland" herald obtained from Union Pacific website. The "Streamliners" photograph is used pursuant to an image usage agreement with the Union Pacific Railroad Museum. All comments, original material and page design copyright ©2006-2010 by Eric H. Bowen. Updated with consist info 2/14/2010.